The Annual General meeting of the Hawke’s Bay Branch will be held on Wednesday, 11th November 7.30pm. in room C14 at the H.B. Community College. Room C14 is in the Single storey Cafeteria Block at the South End of the College. Your attendance is necessary to keep the branch active for 1982. At the conclusion of the general business, Dave Taylor will give a talk on his recent trip to the British Isles and parts of Europe. Capitation fees have been increased to $11 for Members and Associates and to $7 for Retired Members and Students. Since the Board incurred a small loss this year, it is the recommendation of the Committee that these capitation increases be passed on. The loss is due to the Branch supporting a few members with outstanding subscriptions which were due for payment on 1st November, 1980. Section 2, Clause 3; Section 4, Define Country Member and Clause 3; Section 5, Clause 1; and Section 7, Clause 6. 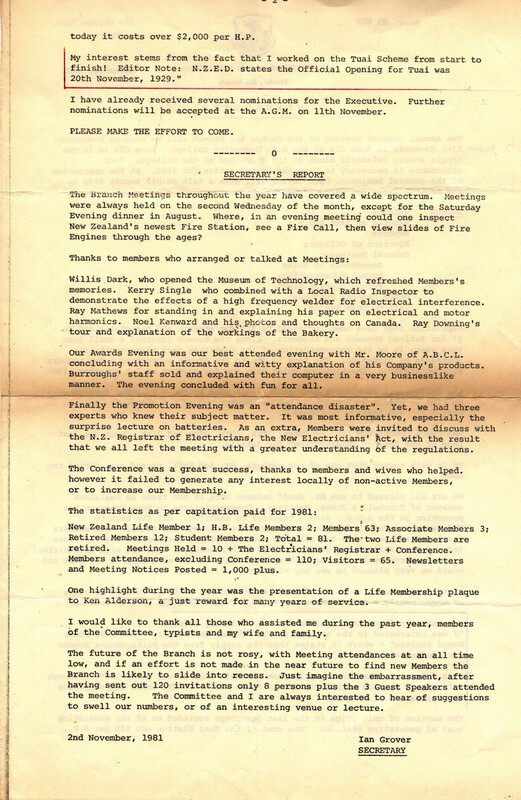 MASTERTON CONFERENCE 1982 – March, 18th, 19th, 20th and 21st. Check the last page of the October “Electrician” for details. It is with regret that one of our members, Mr. Bob Holt, passed away during the month. We are all pleased to see Mr. Geoff Johnson back in the trade as Assistant Manager of Turnbull & Jones, Hastings. Congratulations to Doug Honey on his promotion in the M.O.W., with a transfer to Hamilton. All the best to Ted Parry and family for his new job at Port Moresby, New Guinea. All members thank you and your wife for all your time and effort working for the Institute. Ted and his family leave New Zealand on 15th November. We all wish Alan Hirtzel a speedy recovery in the Napier Hospital. He’s on the mend after a set back and would be very pleased to see any visitors. I received several apologies for nonattendance at Meetings through pressure of work, namely a note from Lauren Colewell, also from the boys at Tomoana. “I was interested in the article in the October Newsletter – “Te H.B. 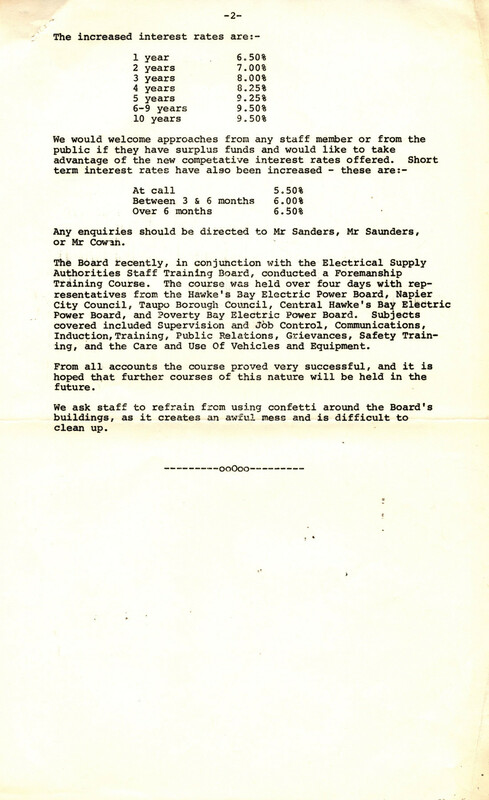 Power Board Evolves”- where it states that the supply from the Waikaremoana Scheme was available in 1926. This is not so, the first supply from the Main station was early 1929, although a temporary station consisting of two Metro Vic – 500 KVA Units was supplying the Wairoa E.P.B. in 1923.
today it costs over $2,000 per H.P. My Interest stems from the fact that I worked on the Tuai Scheme from start to finish! I have already received several nominations for the Executive. Further nominations will be accepted at the A.G.M. on 11th November. PLEASE MAKE THE EFFORT TO COME. The Branch Meetings throughout the year have covered a wide spectrum. Meetings were always held on the second Wednesday of the month, except for the Saturday Evening dinner in August. Where, in an evening meeting could one inspect New Zealand’s newest Fire Station, see a Fire Call, then view slides of Fire Engines through the ages? Willis Dark, who opened the Museum of Technology, which refreshed Member’s memories. Kerry Single who combined with a Local Radio Inspector to demonstrate the effect of a high frequency welder for electrical interference. Ray Mathews for standing in an explaining his paper on electrical and motor harmonics. Noel Kenward and his photos and thoughts on Canada. Ray Downing’s tour and explanation of the workings of a Bakery. Our Awards Evening was our best attended evening with Mr. Moore of A.B.C.L. concluding with an informative and witty explanation of his Company’s products. Burroughs’ staff sold and explained their computer in a very businesslike manner. The evening concluded with fun for all. Finally the Promotion Evening was an “attendance disaster”. Yet, we had three experts who knew their subject matter. It was most informative, especially the surprise lecture on batteries. As an extra, Members were invited to discuss with the N.Z. Registrar of Electricians, the New Electricians’ Act, with the result that we all left the meeting with a greater understanding of the regulations. The Conference was a great success, thanks to members and wives who helped. However it failed to generate any interest locally of non-active Members, or increase our Membership. New Zealand Life Member 1; H.B. 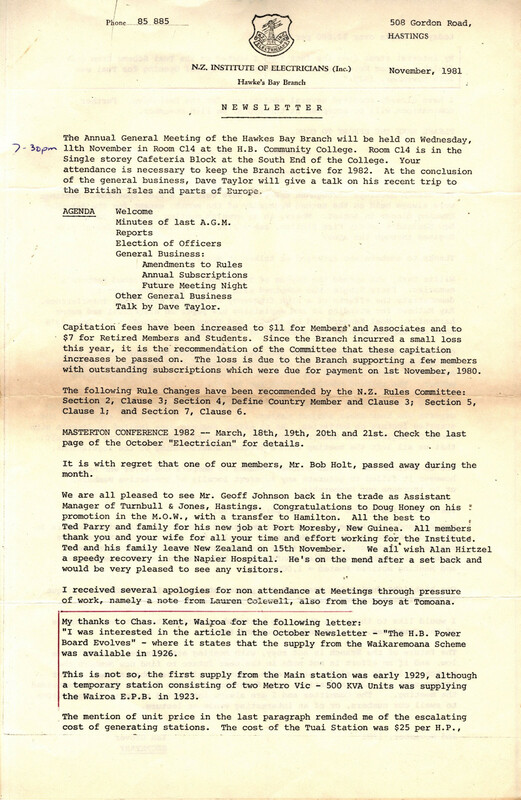 Life Members 2; Members 63; Associate Members 3; Retired Members 12; Student Members 2; Total = 81. The two Life Members are retired. Meetings Held = 10 + The Electricians’ Registrar + Conference. Members attendance, excluding Conference = 110; Visitors = 65. Newsletters and Meeting Notices Posted = 1,000 plus. One highlight during the year was the presentation of a Life Membership plaque to Ken Alderson, a just reward for many years of service. I would like to thank all those who assisted me during the past year, members of the Committee, typists and my wife and family. The future of the Branch is not rosy, with Meeting attendance at an all time low, and if an effort is not made in the near future to find new Members the Branch is likely to slide into recess. Just imagine the embarrassment, after having sent out 120 invitations only 8 persons plus the three Guest Speakers attended the meeting. The Committee and I are always interested to hear suggestions to swell our numbers, or of an interesting venue or lecture. The Napier Police were recently successful in apprehending two youths who were removing fuses from some of the Board’s Power Poles. It is very difficult to control this type of vandalism, and beside [besides] being extremely dangerous, it is most annoying for consumer and Fault Staff. The winter and the restoring of the previous limits of loan money available for interest free Insulation Loans has resulted in a steady increase in the number of people seeking this type of service. During May, the Board received 144 applications for loans, the majority of which were for ceiling insulation only. The Government budget increased the maximum amount available as interest free loans to $400. This move will undoubtedly show another increase in demand for home insulation. Mr. K.R. Gillon, the Board’s Chairman, was recognised in the Queen’s Birthday Honours List as a recipient of the M.B.E. He was also recently awarded the 25th Jubilee Medal. The Staff extended its warmest congratulations to Mr. Gillon, who received these honours for the many years he has contributed to Community Service, and in particular the electrical industry. Anyone interested in depositing money, should contact either Mr. Badland or Mr. Sanders. Mr. Alf Ericksen retired from the Board on Friday 1st July, after 26 years service. Mr. Ericksen was an active member of the Social Club, but is known to many as the man with the money. (Every Thursday that is). We wish to extend to Mr & Mrs Ericksen best wishes for a long and happy retirement. The Board was recently host for another training course for Foremen. 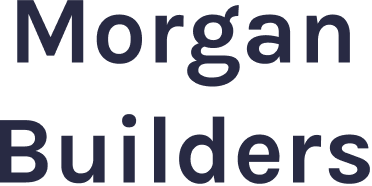 These courses are run by the Electrical Industry Training Board, and comments received by those attending were generally in favour of the course content. It is planned to arrange training courses within the Board for different groups of employees, using the Board’s facilities and staff. The first course was held on Thursday 14th July, for assistant supervisors, and this will be followed in August with a course for apprentices. The Board’s Executive Staff recently looked into the possibility of using the Puneketoro Stream, a tributary of the Mohaka River, for the possible construction of a small hydro scheme. Discussions with the N.Z. E.D. revealed that it is possible that a dam may be built on the Mohaka, at a point between where the Puneketoro now joins the Mohaka, and the site of a power station. Should this be the case then the Board’s proposal would be approximately 15 years before becoming redundant. This would make the development of the Puneketoro uneconomic. The decision to carry out a feasibility study has been deferred by the Board members at the July meeting. Mr. K. Foote has been appointed to the Board’s staff as Accountant, and he will take up his duties during August. Mr Foote is to fill the position left vacant by Simon Cowan last year, and we would like to take this opportunity to welcome him to the Board’s staff. The Parkvale Depot has been the scene of vigorous tree planting in an effort to make the depot more attractive. Mr “Snow” Lowe has been appointed Groundsman & Gardiner [Gardener] and will be responsible for the care and maintenance of the Board’s gardens, lawns, and surroundings at the Depots and Substations. The Housing Corporation has cleared the area of ground to the West of the Parkvale Depot, and a new fence has been erected between the Housing Corporation land, and the Board’s Depot. Your editor is again putting pen to paper, in an attempt to keep you informed about what is happening around the Board. We gave been saying farewell to some long service employees who have retired from the Board, noteably [notably] Doug Struthers, Jack Sutherland and Jack O’Donnell. Functions held in the Social Hall were well attended and our best wishes for a long and happy retirement are extended to them all. George McKee retires today after almost 40 years service, and no doubt his farewell will be a memorable one. While on the subject of retirement, Noel Cohen has recently left the Board and his presence will be missed around the Eastbourne Street depot. Our best wishes for a long and happy retirement are also extended to Noel. Because of lack of loan finance it has been decided to defer work on the Arataki Substation. The land has already been purchased and negotiations are in hand for access to properties to allow for the undergrounding of cables. Preliminary work is therefore still being finalised so that building of the substation can proceed when finances permit. Land has been purchased for the Windsor Substation although legal problems have delayed work commencing on the site. However, as soon as these have been finalised work will begin on this project. The transformer switchgear, and cabling have all been ordered and if delivery dates are kept all should arrive as planned. Progress has continued on the Tutira Line and substation with the planned completion and livening of the line set down for the end of May. An interesting feature of this line has been the use of a helicopter for the transporting and placing of poles on areas of difficult access. It appears that we have a bicycle burgler [burglar] around the Eastbourne Street Depot recently, as Rex Brinson had a front wheel stolen from his bicycle whilst parked in the stand. Many jokes have been made about Mr. Brinson’s loss, not least being how far he travelled before realising [realizing] he was a wheel short. However, the effect is worrying, and any strangers in our yard should be reported to a supervisor. At a recent Board meeting it was decided to close Ranfurly House, and eventually demolish the building. The cost of maintenance and the provision of adequate safety arrangements has made it an uneconomic proposition. It is intended that all furniture and fittings will be sold once the building becomes unoccupied. Details of these articles will be listed on the notice board within the next few days. Miss Sandra Dodd from the Draughting Office and Mr Rex Cave from the Hastings Sales Office were married on Saturday 15th May at St. Columbus Church, Taradale, and our good wishes are extended to them for the future. The government has recently announced increased interest rates that Local Bodies are permitted to pay for loan monies. It is hoped that these increased rates will induce investers [investors] to subscribe to our loans and in so doing, provide much needed finance to continue the expansion of our reticulation system. It is anticipated that this year up to $1,000,000 will be required in loan monies to continue the rapid expansion in Flaxmere, Tamatea and other housing areas to build the Windsor Substation and to provide for the continued growth of the reticulation system. Any enquires should be directed to Mr. Sanders, Mr. Saunders, or Mr Cowan. The Board recently, in conjunction with the Electrical Supply Authorities Staff Training Board, conducted a Foremanship Training Course. The course was held over four days with representatives from the Hawke’s Bay Electric Power Board, Napier City Council, Taupo Borough Council, Central Hawke’s Bay Electric Power Board, and Poverty Bay Electric Power Board. Subjects covered included Supervision and Job Control, Communications, Induction, Training, Public Relations, Grievances, Safety Training, and the Care and Use Of Vehicles and Equipment. From all accounts the courses proved very successful, and it is hoped that further courses of this nature will be held in the future. We ask the staff to refrain from using confetti around the Board’s buildings, as it creates an awful mess and is difficult to clean up. On Wednesday the 12th of October at 7.30p.m., members of the Branch are to be the guests of Watties Canneries. We are to meet at the plant door, near Wattties pedestrian crossing in King St, North, Hastings. Mr. Paul Buck, the Can Plant Electrician has kindly offered to show us the newly installed Soudronic Can Maker. This machine is solderless. It is intended to explain the plant’s operation from the upstairs office passage windows overlooking the factory then go down the factory floor. Management have asked for all visitors to wear protective footwear and refrain from taking alcohol prior to the meeting. Apparently the lacquer fumes and alcohol react. Please keep the 9th of November free as our Annual General Meeting is to be held at the H.B. Community College. 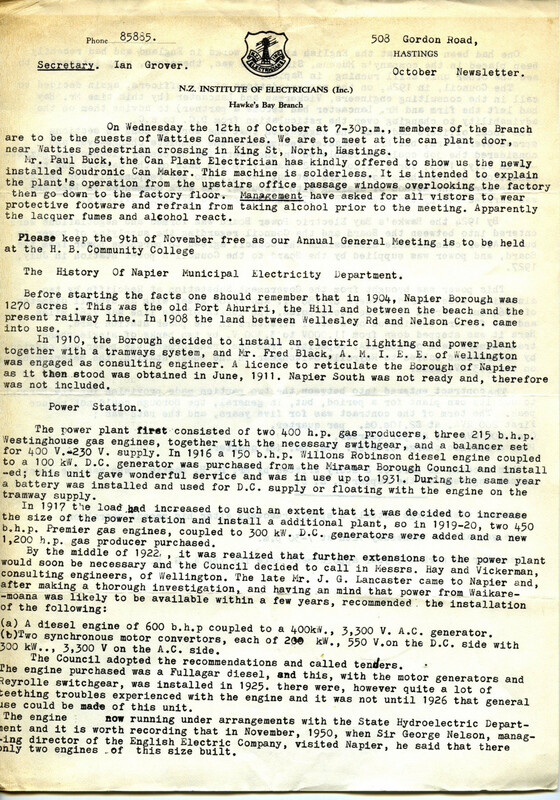 The History Of Napier Municipal Electricity Department. Before starting the facts one should remember that in 1904, Napier Borough was 1270 acres. This was the old Port Ahuriri, the Hill and between the beach and the present railway line. In 1908 the land between Wellesley Rd and Nelson Cres. came into use. In 1910, the Borough decided to install an electric lighting and power plant together with a tramways system, and Mr, Fred Black, A.M.I.E.E. of Wellington was engaged as consulting engineer. A licence [license] to reticulate the Borough of Napier as it then stood was obtained in June, 1911. Napier South was not ready and, therefore was not included. The power plant first consisted of two 400 h.p gas producers, three 215 b.h.p. Westinghouse gas engines, together with the necessary switchgear, and a balancer set for 400 V.-230V. supply. In 1916 a 150 b.h.p. Willons Robinson diesel engine coupled to a 100 kw. D.C. generator was purchased from the Miramar Borough Council and installed; this unit gave wonderful service and was in use up to 1931. During the same year a battery was installed and used for D.C. supply or floating with the engine on the tramway supply. In 1917 the load had increased to such an extent that it was decided to increase the size of the power station and install a additional plant, so in 1919-20, two 450 b.h.p. Premier gas engines, coupled to 300 kw. D.C. generators were added and a new 1,200 h.p. gas producer purchased. (a) A diesel engine of 600 b.h.p. coupled to a 400kw., 3,300 V.A.C. generator. (b) Two synchronous motor convertors, each of 200 kw., 550 V. on the C.D. side with 300 kw., 3,300 V on the A.C. side. The Council adopted the recommendations and tenders. The engine purchased was a Fullagar diesel, and this, with the motor generators and Reyrolle switchgear, was installed in 1925. There were, however quite a lot of teething troubles experienced with the engine and it was not until 1926 that general use could be made of this unit. The engine now running under arrangements with the State Hydroelectric Department and it is worth recording that in November, 1950, when Sir George Nelson, managing director of the English Electric Company, visited Napier, he said that there was only two engines of this size built. One had been in use at the English Electric works in England and had recently been placed in the company’s Museum. Sir George was, therefore, very interested to the other unit still running in Napier. 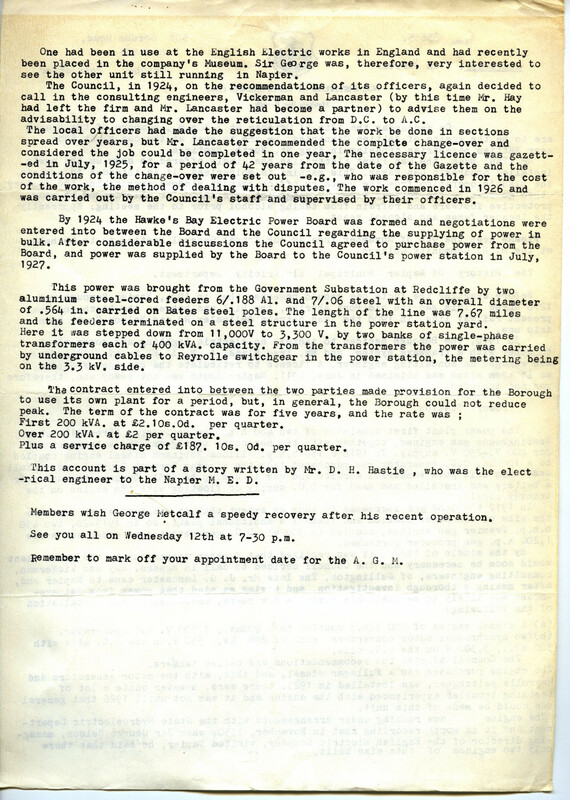 The Council in 1924, on the recommendations of its officers, again decided to call in the consulting engineers, Vickerman and Lancaster (by this time Mr. Hay had left the firm and Mr. Lancaster had become a partner) to advise them on the advisability to changing over the reticulation from D.C. to A.C. 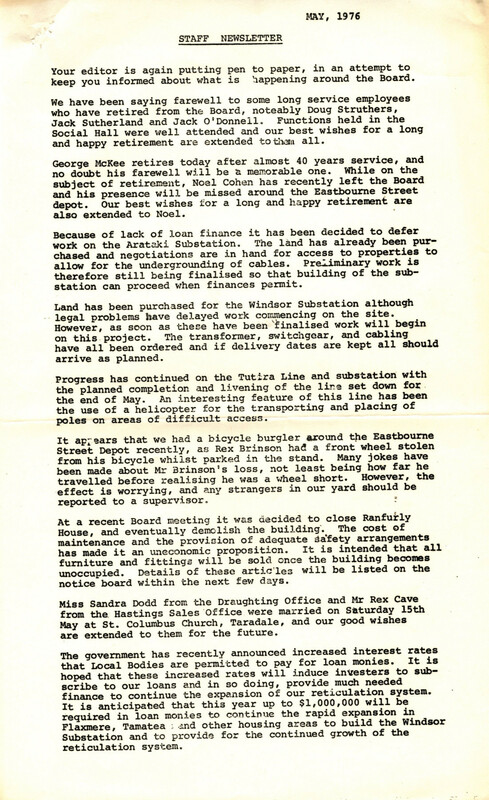 The local officers had made the suggestion that the work be done in sections spread over years, but Mr. Lancaster recommended the complete changeover and considered the job could be completed in one year. The necessary license was gazetted in July, 1925, for a period of 42 years from the date of the Gazette and the conditions of the changeover were set out – e.g., who was responsible for the cost of the work, the method of dealing with disputes,. The work commenced in 1926 and was carried out by the Council ‘s staff and supervised by their officers. By 1924 the Hawke’s Bay Electric power Board was formed and negotiations were entered into between the Board and the Council regarding the supplying of power in bulk. 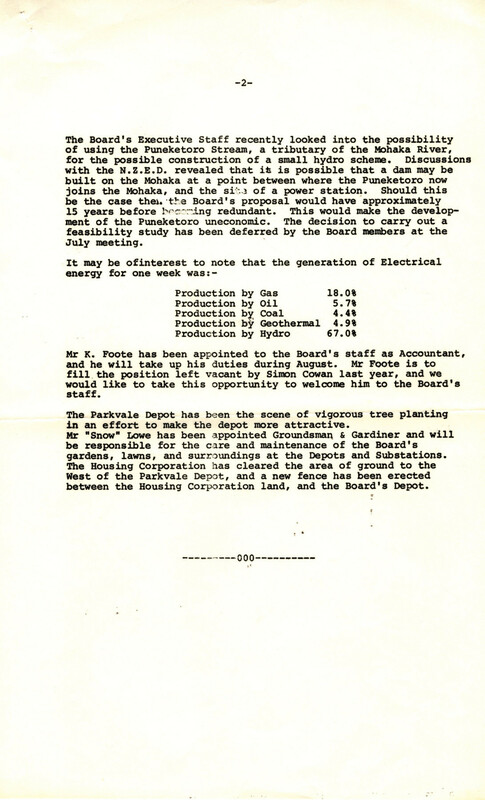 After considerable discussions the Council agreed to purchase power from the Board, and power was supplied by the Board to the Council’s power station in July, 1927. This power was brought from the Government Substation at Redcliffe by two aluminum steel-core feeders 6/.188 Al. and 7/.06 steel with an overall diameter of .564 in. carried on Bates steel poles. The length of the line was 7.67 miles and the feeders terminated on a steel structure in the power station yard. Here it was stepped down from 11,000V to 3,300 V. by two banks of single-phase transformers each of 400 kVa. capacity. From the transformers the power was carried by underground cables to Reyrolle switchgear in the power station, the metering being on the 3.3 kV. Side. The contract entered into between the two parties made provision for the Borough to use its own plant for a period, but, in general, the Borough could not reduce peak. Over 200 kVA at £2 per quarter. Plus a service charge of £187.10s.0d. per quarter. 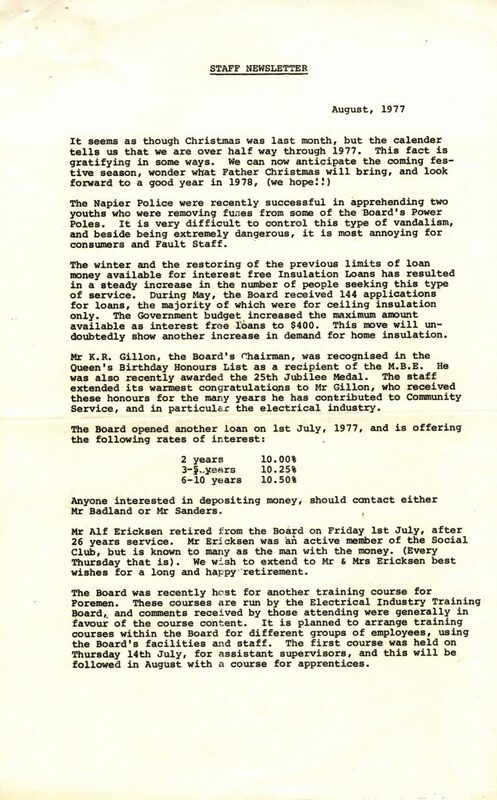 This account is part of a story written by Mr. D.H. Hastie, who was the electrical engineer to the Napier M.E.D. Members wish George Metcalf a speedy recovery after his recent operation. See you all on Wednesday 12th at 7-30p.m. Remember to mark off your appointment date for the A.G.M.